SCBWN Corporate members only. Book up to 10 tickets at members rates. A Member of the Sunshine Coast Business Women's Network enjoys discounted tickets to events. Ticket price includes a copy of Emma's new book "Winging It". The general public are encouraged and very welcome to attend Sunshine Coast Business Women's Network events. Ticket price includes a copy of Emma's new book "Winging It". Available to both Members and non-members. Please include the name of attendees and dietary requirements below. Each guest will receive a copy of Emma's new book "Winging It". Trade Tables are available to Members Only and include one (1) Member ticket. We are so excited we're just bursting to tell you! 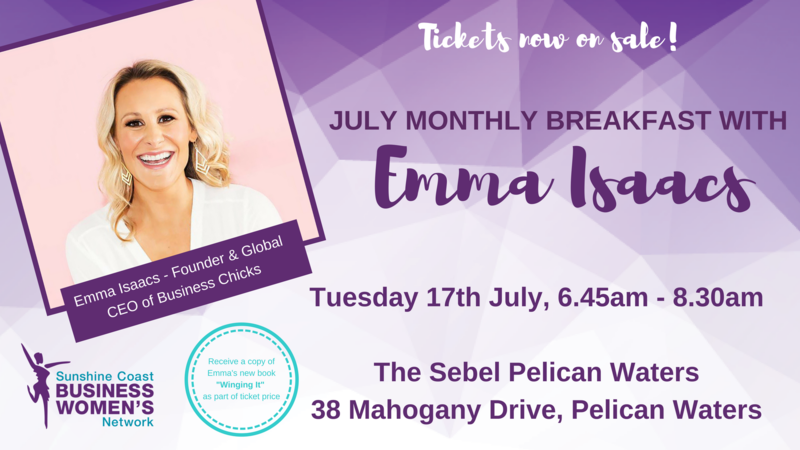 We hinted at it during our last event and we can now officially announce who we have secured as our guest speaker for July... drum roll please... it's the amazing Emma Isaacs, Founder and Global CEO of Business Chicks! Emma is flying in from LA and will be joining us on the 17th of July with her brand new book. You need to LOCK THIS IN YOUR DIARY right now as you won't want to miss out! Your ticket price will include a copy of Emma's new book "Winging It". Emma Isaacs is the founder and global CEO of Business Chicks, Australia’s largest community for women. She is passionate about inspiring women to be bold, be courageous and to take risks. When Emma was just eighteen, she became the co-owner of a small recruitment company where she had just started working. When she sold the business eight years later, it had grown exponentially and been named as Australia’s Favourite Recruiter in the SEEK Awards for three consecutive years. When Emma was twenty-six, and while she was still running the recruitment company, she felt the urge to try something new. She was invited to a small event by a group called Business Chicks, where she learned the business was up for sale. Emma took a leap of faith and bought it. Over the past thirteen years, Emma has transformed Business Chicks from the ground up, growing it from a group of 250 members to what it is today – a global enterprise that operates in two continents, 11 cities and produces more than 100 events annually, with past speakers including Sir Richard Branson, Seth Godin, Dr Brené Brown, Arianna Huffington, Diane von Furstenberg, Sir Bob Geldof and Jamie Oliver. Born and raised in Sydney, Emma now lives in Los Angeles with her husband and five young children. She has raised over $AU12 million for charity, is a serial property investor, and continues to head up the now international Business Chicks. Please note - All dietary requirements must be in by 11th July for catering purposes.